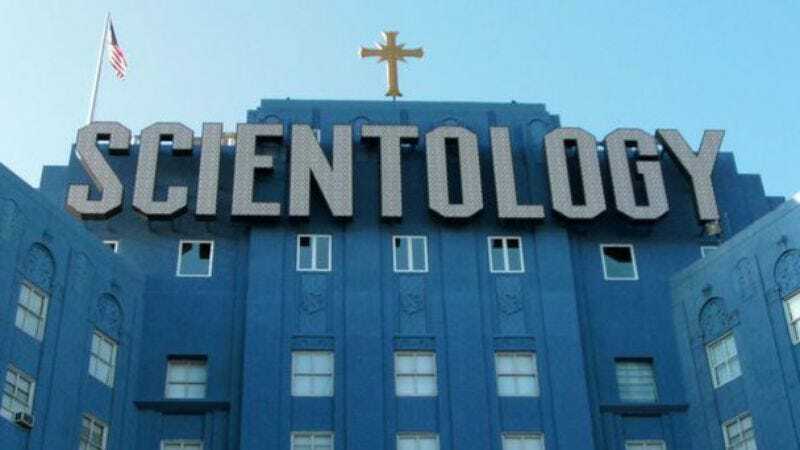 According to the suppressive persons at The Hollywood Reporter, the totally legitimate religious institution known as The Church Of Scientology is apparently trying to stop theaters in Florida from showing Going Clear, Alex Gibney’s documentary about the church that aired earlier this year on HBO. The Cobb Countryside 12, a small theater in Clearwater, Florida (which also happens to be the home of Scientology’s bizarrely named headquarters, Flag Land Base), was planning to start showing the film soon, but then it contacted HBO to say that it had canceled those plans after supposedly “receiving threats from the church.” Apparently Scientology doesn’t want the people to know about all of the monstrous things it does? Another local theater, the AMC Woodlands Square 20, agreed to pick up Going Clear instead, but now it has also been forced to cancel its screenings. This time it’s not entirely because of a totally legitimate religion and its totally legitimate strong-arm techniques, though, it’s because the AMC Woodlands Square theater simply isn’t big enough for all of the people who want to learn about Scientology and its colorful history of blackmail, brainwashing, and mysterious spousal disappearances. Going Clear has now been moved to Tampa’s AMC Veterans 24, which reportedly gives the theater chain “more flexibility,” though whether that actually refers to the size or the increased distance between the theater and Flag Land Base (which may also be the name of something from the G.I. Joe cartoon) is unknown. Going Clear, based on the book by Lawrence Wright, is also still streaming on HBO Go, so anybody who wants to watch it can still see it there. It’s not like Scientology is going to storm into someone’s house and physically stop them from watching it, right? A totally legitimate religion wouldn’t do that. Also, Scientology released a statement responding to the claims in Going Clear back when it initially premiered, but it was basically just “nuh-uh!” over and over again.